ZAKA official describes desperate search 'leaving no stone unturned,' details dangers in forest as fears for life of epileptic Israeli grow. 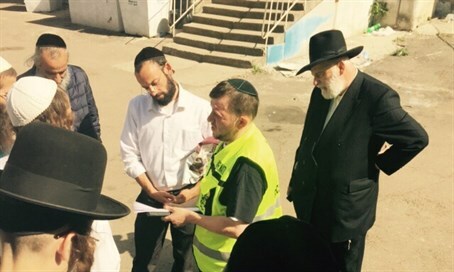 Teams of the ZAKA rescue organization on Thursday continued their desperate search in Sofyivsky forest at the Ukrainian city of Uman after Amir Ohana, a missing Israeli who was among the roughly 45,000 Jews traveling to Uman for Rosh Hashanah. Ohana (28) has been missing since Tuesday afternoon, when he went out to be alone on the second day of the Jewish New Year, during which many Jews traditionally visit Uman where Rabbi Nachman of Breslov lived. Chaim Vingarten, head of ZAKA's operations branch, told Arutz Sheva on Thursday that Ohana's family in Israel reported his disappearance to ZAKA after the holiday ended on Tuesday night. "His wife didn't hear from us, she contacted his friend and then got in touch with us. He (Ohana) is suffering from epilepsy, and therefore anything is possible. There is a great concern for his life," said Vingarten. According to the ZAKA official, there are many dangers in the forest where Ohana went missing. "In Sofyivsky forest there are swamps and pools, it's a forest with many branches and there is also the possibility that thugs attacked him or maybe he was abducted," he said. "Everything is being checked; unfortunately he doesn't have a cell phone, all that we know is that he told his roommate on the evening of the second day of Rosh Hashanah that he was going to be alone. Everyone knows this place." Vintgarten said a special hovercraft is being deployed in the searches, adding that "unfortunately we got the report at the end of the holiday after 60 of our volunteers had already returned to Israel." "We had to return six volunteers to Uman, we sent the most senior commanders there with an advanced hovercraft." "We're praying that we find him but the concerns are serious," he concluded. "Every minute that passes is troubling. There are more volunteers that flew there. Currently five ZAKA commanders and dozens of volunteers are checking under every stone." ZAKA revealed in a statement on Thursday that its "efforts include extensive interviewing and checking CCTV footage in order to find leads, as well as an organized physical searching of a wide area using many volunteers on the ground." On Thursday, a specialist search and rescue volunteer team led by ZAKA Special Operations Director Haim Outmezgine was dispatched to Uman from Israel. One volunteer on the team is experienced in using ZAKA drones for search and rescue missions. "This is a very big and complex operation," explained ZAKA volunteer Yossi Frankel, who is coordinating the search from in Israel. He said that the organization is in constant contact with Ohana's wife. "Today, we have flown out specialist search and rescue volunteers from Israel. We are currently awaiting approval from the Ukrainian authorities to send out volunteers from the ZAKA Canine unit and the ZAKA Divers unit, in order to provide the fullest response possible to this search mission," added Frankel.